"I'd rather regret the things I've done than regret the things I haven't done." I mentioned at the end of the August 7 entry about my exhilarating Harding Icefield hike on a beautiful sunny day that I fell near the end and spent three hours last evening at the Seward hospital ER getting the wounds cleaned out, stitched, and bandaged. I was awake half the night from pain in my injured arm and the inability to find a comfortable position with no contact on my elbow. One of the things I thought of while I was lying there was leaving Seward for Anchorage today, a day early. 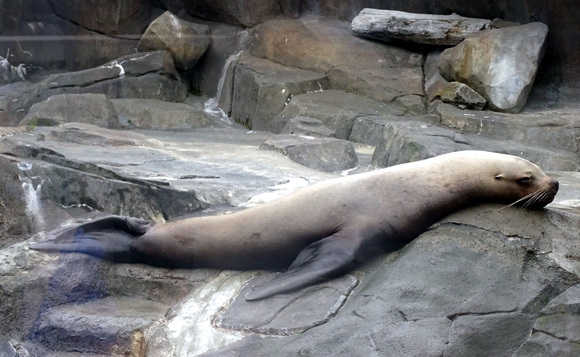 Except for visiting the SeaLife Center, we'd pretty much done what we wanted to do in Seward. There's a 100% chance of rain tonight and tomorrow, which would mean getting the camper ready to leave when it's wet -- and setting it back up at JBER would probably be wet, too. In addition, traffic northbound on the Seward Hwy. toward Anchorage would likely be much heavier on Sunday. So when I got out of bed at 7:30 this morning and saw fog blanketing the campground I knew I'd bring up the possibility to Jim of leaving a day early. When I suggested it, he was all in. 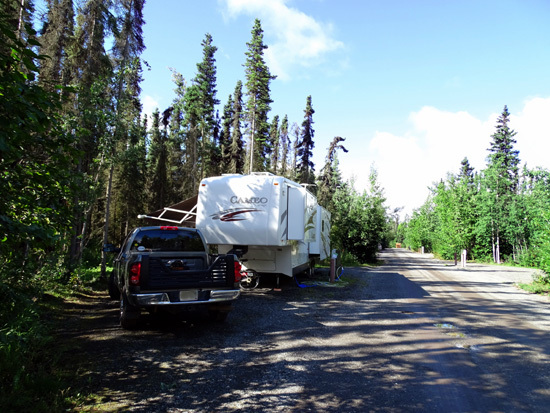 We got the rig ready and hooked up by 10:30 AM, dumped the tanks, paid for four days ($100), then parked the Cameo in the gravel pull-off across the road from the resort, unhooked, and took the truck into town to visit the SeaLife Center. I wrote about it in the previous entry. That's pretty much what I felt like this morning! On the way back to the resort we got a few gallons of diesel, which is doggone expensive in Seward -- $3.74/gallon compared to $3.31 still in Anchorage. Jim hooked the Cameo back up just after noon and we drove 135 miles to Joint Base Elmendorf-Richerdson (JBER) with one brief stop along the way. We lucked out re: road work -- it's done only Monday to Thursday, because of the heavy traffic on weekends. 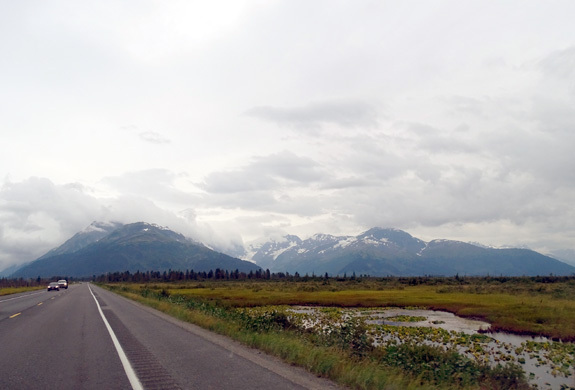 Traffic wasn't too bad on the southern half of the Seward Highway (all the scenic photos below). The worst was from Portage Valley along Turnagain Arm to Anchorage. It took us about three hours to get to JBER. Traffic was moderately heavy going northbound (our direction) but there were enough turnouts and passing lanes that traffic never got too backed up behind us. 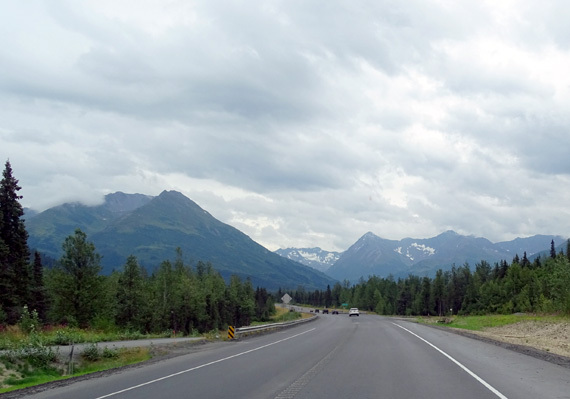 What surprised us most was the heavy volume of traffic going the other direction to the Kenai Peninsula. There were some RVs but mostly just cars and trucks. There are several fishing derbies on the peninsula this weekend. Seems like those folks would have campers and/or boats and already be there. Perhaps there are some festivals we don't know about. 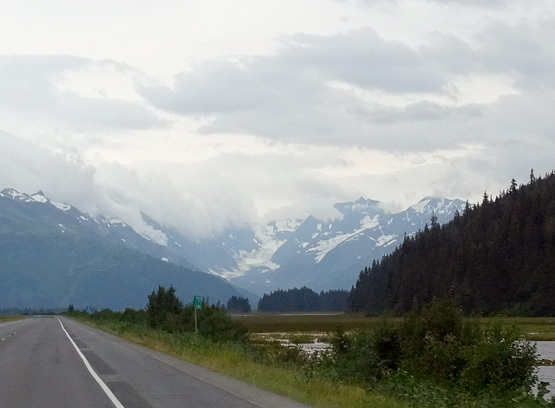 The weather improved as we drove north and west past Portage Valley along Turnagain Arm. The clouds were higher so we could see the mountaintops most of the way. I didn't get any photos along Turnagain Arm this time because I was busy trying to keep Casey in the back seat with my one good arm. She got scared when we hit a pothole and wanted to get up front with us. 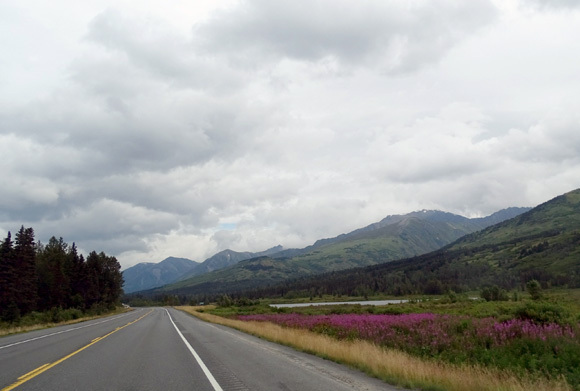 Jim says he hopes he never has to drive the Turnagain Arm stretch of road again. It is a traffic nightmare, with too many wrecks and near-misses caused by speeders versus so many tourists who want to enjoy the scenery. 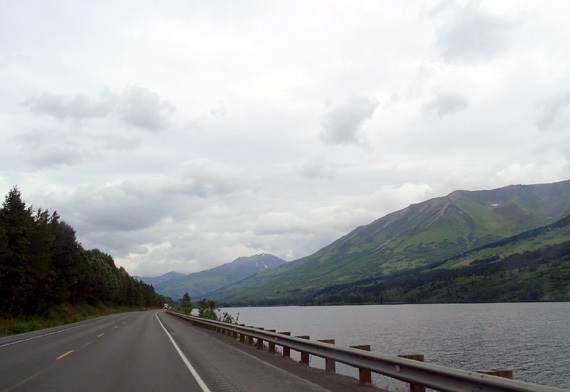 Seward Hwy. curves around the eastern end of Turnagain Arm. It was another warmer-than-average day in Seward and Anchorage but not as warm as the last few days. Anchorage set three new daily high temperature records this past week, with temps in the high 70s F. Today was cooler (upper 60s) and mostly cloudy but we did see some sunshine before suppertime. It'll be rainy in Anchorage tomorrow, too, but at least we have full hookups now, a good internet signal, several TV stations, and more to do (at lower cost) than in Seward. 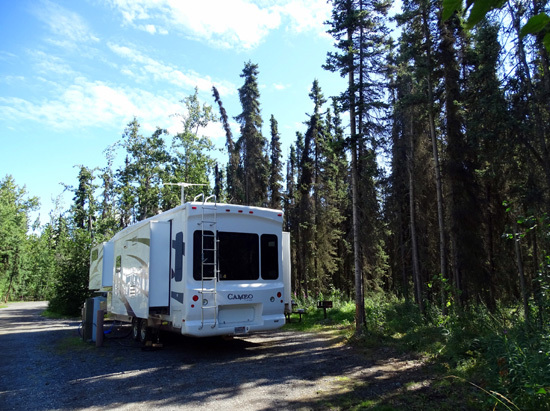 This is our fifth time at Black Spruce Campground at JBER and we're in our seventh different site. I like this one the best of any we've had because it's near the office (better phone and MiFi reception) but not too close and it has a nice yard for us to walk the dogs. 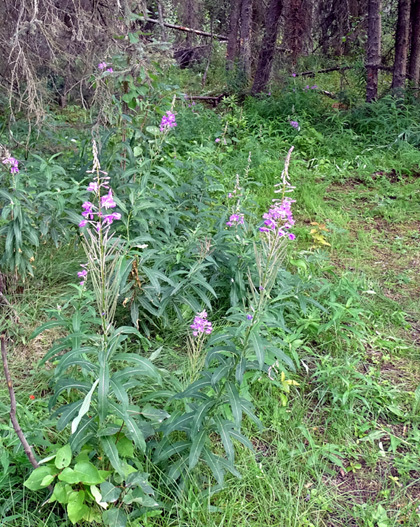 We have some fireweeds that have a while yet to bloom, and lots of bunchberries with bright red berries (the flowers are all gone now). Fireweeds bloom from the bottom up, so these are just starting. 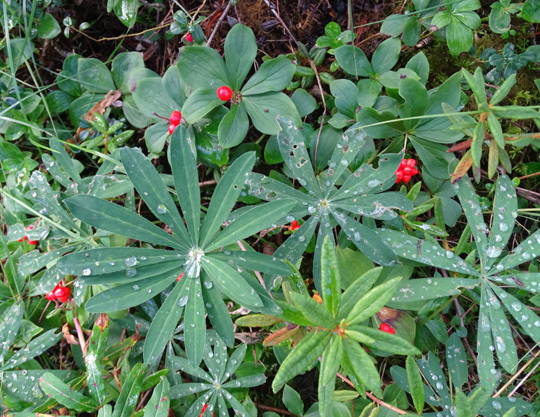 Raindrops on bunchberry (smaller) and lupine (larger) leaves; the flowers are gone from both species. Our second surprise of the day -- after the heavy traffic on the Seward Hwy. 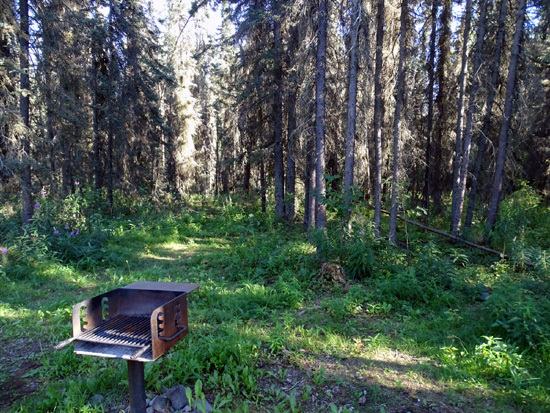 -- was how many good sites were open at Black Spruce. There are 45 sites with either full hookups or water and electricity. We feared we'd have to park one or more days in the back, where there aren't full hookups, and move when a more desirable site became available. However, we had our choice of about eight different sites in the front half of the first two rows, including the site we had last time. We didn't really like that yard or all the distractions at the entrance, so we picked this one nearby. It's around a little curve and on the other side of the driveway. It's nice to have a lot more space and privacy again. When I talked with the campground host later, he said folks are already starting to head back to the Lower 48. Wow! 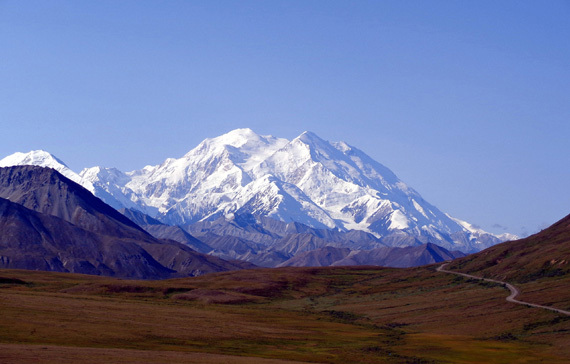 It still seems early to us but it's already considered to be autumn in Alaska. We plan to be up here at least until the end of August and perhaps until after Labor Day on September 7. We got settled in quickly, ate some lunch, caught up on news and e-mail, exercised the dogs, etc. I laid down on the couch before supper but didn't seriously try to go to sleep for fear I'll have trouble again tonight. Despite taking a prescription pain pill this morning, my arm stung all day. I took another one at 4 PM and it felt better. That was the last I needed anything stronger than OTC pain meds. 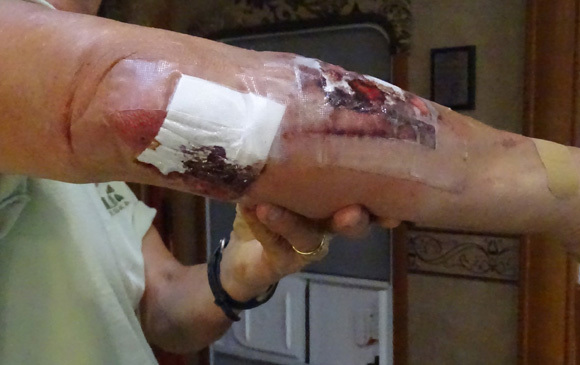 We took off the bloody bandages (next photo) after supper and were surprised at how good the wounds looked -- maybe not to people reading this, but good to us considering what they looked like before going to the ER! of skin tore loose. We hope it'll grow back OK (it did!). We cleaned them up, applied more antibiotic cream, and redressed them. Now I'm not afraid to bend my arm. It's been a pain (literally) to keep it as straight as possible, since I'm right-handed. 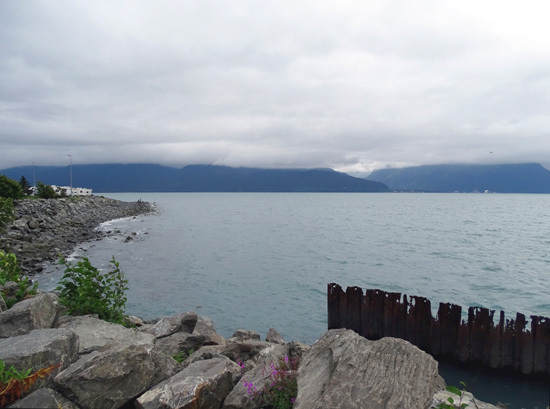 It also felt great to take a shower this morning and wash my hair before we left Seward. We put plastic wrap around the bandages and secured it with tape. That kept the water out just fine. After this it's OK to get the bandages wet. My measly stand-up bath after getting back from the ER last night didn't do the job very well and it's another reason I had trouble sleeping. lower arm. If you look closely you can see several stitches. I'm not tired from the two Harding Icefield hikes but I'm still a little sore from that nasty fall yesterday. 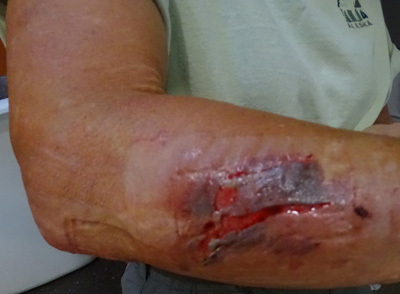 My arm feels much better tonight after cleaning and re-dressing the wounds. 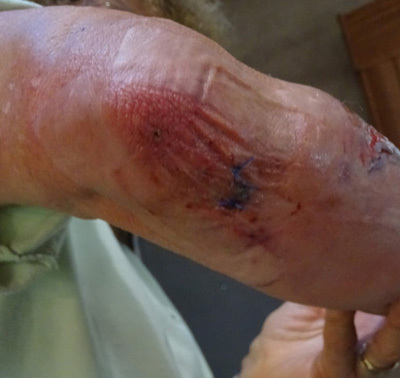 The gauze we wrapped around my elbow to stop the bleeding was getting tight as my arm swelled (you can see swelling in the last photo above) and it was a relief to get it off now that the bleeding is stopped. It was like a tourniquet. I hate having to give up some of the mountain hikes I wanted to do in the Anchorage area but I shouldn't risk doing more damage until the current wounds all heal. I've still got scabs from the recent Bird Ridge fall, a bike fall on the Trail of Blue Ice, and now the ice field trail fall. 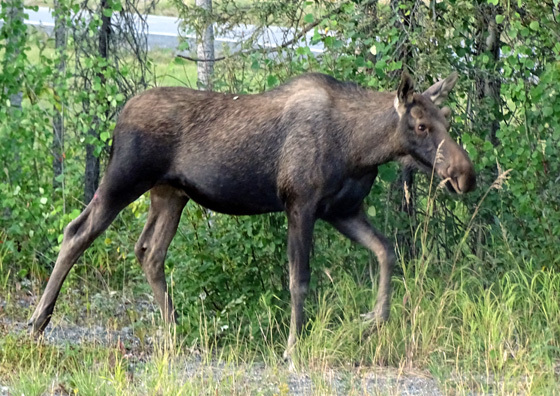 JBER has lots of moose on base; here's one I saw when walking Cody near the campground on 8-14-15. Hopefully, I'll heal adequately soon and be out on mountain trails again. Meanwhile, I'll walk the dogs and cycle around the campground and on base.